The most patriotic act is traveling outside your own country’s borders, and sharing your experiences when you come back. Today is July 4. Time to reflect on independence. Freedom. Patriotism. What it means to be an American. In a sense, the country I call my homeland was founded upon the cherished value that the right to travel should be protected. The idea is implied by U.S. laws, which permit Americans to travel with greater ease and to more countries than perhaps any other government in the world. It is also inspired by the dramatic journeys of the first colonists who traveled long distances to establish one of the world’s most radical social and political experiments. America is not simply a nation of immigrants; it is a nation of travelers: Gold rush prospectors pushing their horses to pull wagons across the country in search of riches. Anthropolgists, sociologists, and naturalists convinced they could discover new people, new species, new lifeways. Settlers who braved rough terrain to push the boundaries of the nation further and further west. And, as the nation progressed, aviators and risk-taking adventurers of all sorts who wanted to explore areas that seemed to exist beyond reach: the sky. Space. The deep sea. America is not simply a nation of immigrants; it is a nation of travelers. What united all of these travelers was not a simple hedonistic desire to see their country and the world, but to do so as representatives of the United States, traveling on behalf of their fellow Americans. In going, they would share news of America with the world. In returning, they would share news of the world with America. That’s the reason I travel to Cuba, the one country to which Americans are technically forbidden to travel unless they possess a US government authorized license. The thought of visiting Cuba never occurred to me until I befriended the man who who would become my husband. What country had produced this human who was so funny, so caring, so smart, so complex? What was it about the country that compelled him to leave? And why was it so much a part of him that it influenced everything from our daily conversations to the food we ate to the music we listened to? I traveled to Cuba because I wanted to learn and understand more about the country that my own government demonizes. 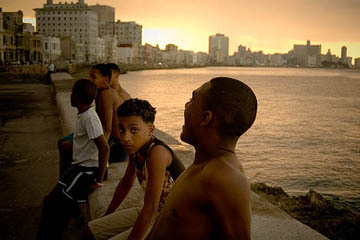 I first traveled to Cuba in 2005 and have returned at least twice each year since. I traveled there because my husband couldn’t. I traveled there to be welcomed into Francisco’s family. I traveled there so I could come back and share with Francisco what he could not see for himself: that his son, nine months old when he left, is so much like him. That his mother still loves to complain and boss people around. That his family is poor, but incredibly close and mostly happy. I wanted to cut through the superficial analyses of anti-Castro reports that failed to acknowledge that Cuba has a lot to teach the world about agriculture, education, environmental responsibility, and medicine. And just as much, I wanted to cut through the equally shallow and overly romanticized pro-Castro views, which fail to acknowledge the shortcomings and missteps of the Cuban Revolution. There was only so much that books could teach, especially since so many are written with either pro- or anti-Cuba agendas. Each time I went to Cuba, I understood more about the country. With my own eyes, I saw how important family was. I saw how creative people could be under conditions of limited resources, and how the generosity of the human spirit soars in such circumstances. I saw joy and resilience that I’d not seen in any of the other countries I’ve visited. I listened to people who openly told me what they thought about Castro and the Revolution: It was an important and worthwhile experiment, one that had achieved great successes and, at the same time-like any other country-suffered from oversights and mistakes. Each time I wrote about my experiences because I believed they were important; that the power of words was so strong and the insight of first-hand experiences gained through travel have no match. I knew what I was doing was important when I started receiving e-mails from people who wanted to know how they could travel to this forbidden country. The power of travel was manifest when they went to Cuba, came back, and shared their stories. I attached my name to what I wrote despite the risks because I believe that the act of traveling and then sharing is the most American, the most patriotic, the most democratic act an ordinary citizen can take. I’m not the only American who believes this. John Quincy Adams was one such leader. Adams was able to travel at an early age thanks to his father’s diplomatic post. Theodore Roosevelt was also an avid traveler, both in the United States and beyond. In his voluminous travelogue, A Book-Lover’s Holidays in the Open, Roosevelt describes his journeys and wilderness adventures in North and South America, sharing his insights. Were he alive now, I wonder what Roosevelt would say about what Cuba can teach the world. And I wonder what he would say about a decades-old isolationist foreign policy that believes, erroneously, that a travel ban, just one part of a complex blockade, will actually make America and the world a better, safer, more democratic place. Travel. It’s the most patriotic, American thing you can do. Happy Fourth of July.